With US equities opening broadly weak, the VIX managed the second consecutive daily gain, settling +4.8% @ 14.89 (intra high 16.67). Near term outlook is for VIX 17/18s. There is 'small' chance of 22/25.. if sp' breaks (briefly) under the 2000 threshold. 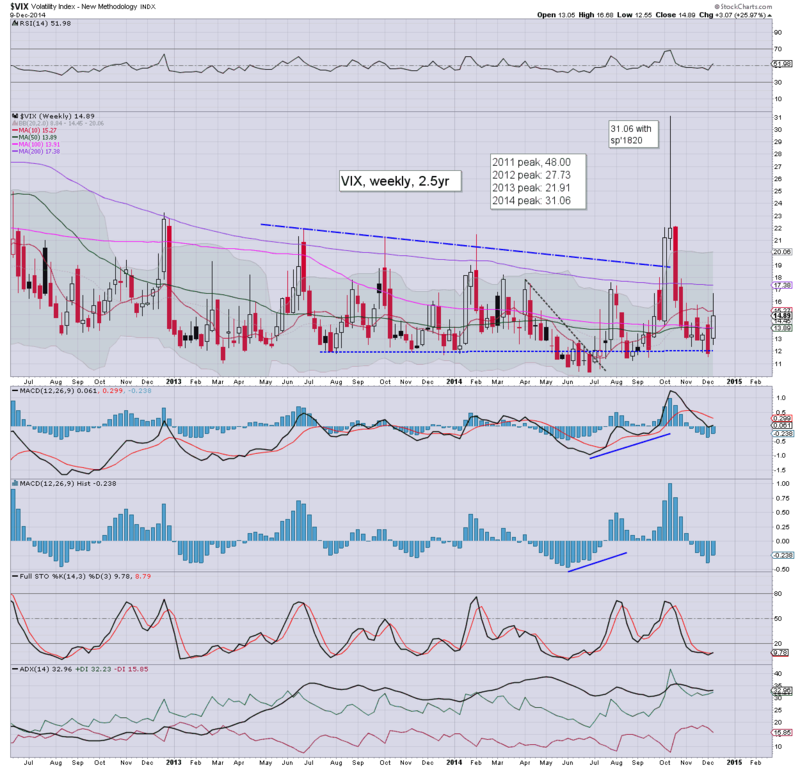 *despite the very strong latter day equity recovery, it is notable that the VIX still managed a gain. Clearly... after a fair few weeks of minor chop.. the VIX is back on the rise. 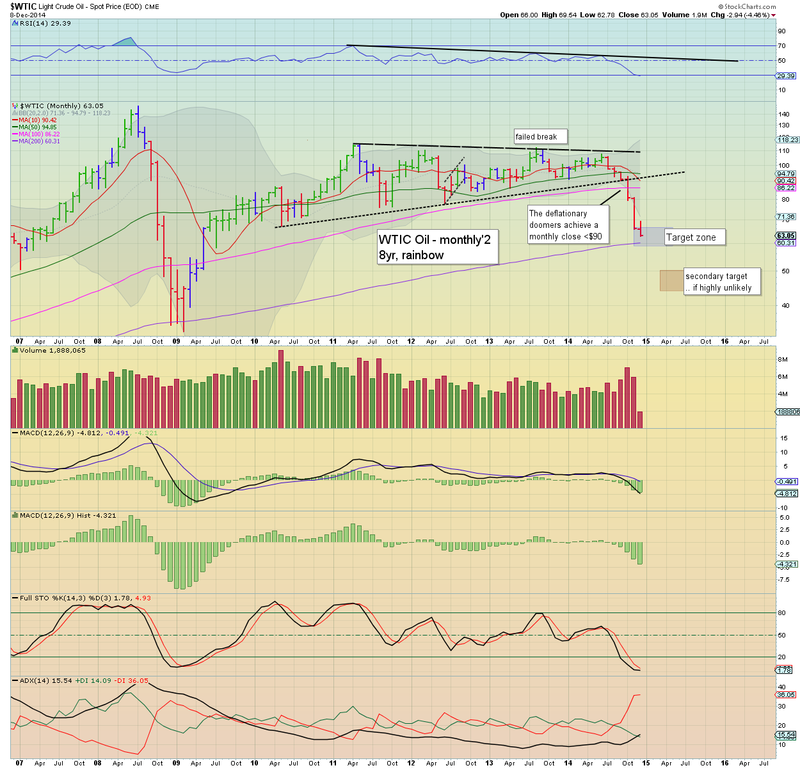 Considering we have already broken into the 16s - with sp'2030s, the 17/18 zone looks very likely. The big issue is whether we'll see a brief washout, with VIX 22/25... although that would probably require sp'1950.. which I find hard to believe. US equities saw bit of a roller coaster day... opening sharply lower, but then a very strong bounce, sp'500 settling -0.5pts @ 2059 (intra low 2034). The two leaders - Trans/R2K, settled -0.6% and +1.8% respectively. 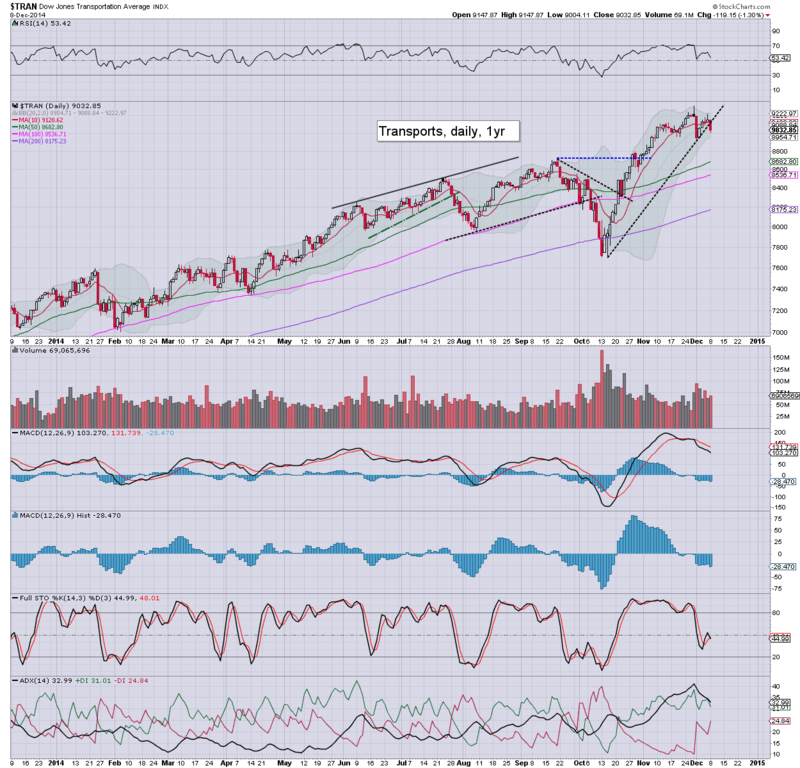 Near term outlook is for a retrace.. at least to 2020/15. A typically crazy latter day bounce.. but even more powerful than most bull maniacs would have dared hoped for. Were the BoJ spending extra new money today in the US market? Trying to pick up 'bargains' for Christmas, is that it? Seriously... a bounce to 2056 was somewhat understandable, but when taken with the closing gains in the R2K and Nasdaq... today was a major fail for the bears. US equities look set for renewed weakness in the closing hour, with a daily close in the sp'2040s, with VIX 16s. Metals are set to hold a second day of gains, Gold +$24. Oil is seeing renewed strength, +1.3%. No doubt the intraday bounce will have annoyed the bears, but still.... price action is VERY suggestive that we're finally seeing a retrace. 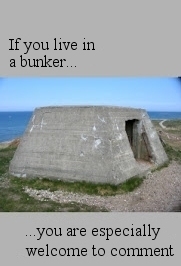 The only issue is how far down. Ultimate problem for the bears is the Fed... with the FOMC of next Wednesday.. likely to be a brick wall to more substantial declines. 3.17pm.. sp'2056.... pretty tedious again, but seriously.. who the hell would be buying here? 3.30pm.. Market remains stuck at the 50% retrace of 2056 or so. I'd only get concerned that today was another tease to the bears, on any daily close >2060. .. and this kind of bounce is why I've ZERO interest in meddling in the short side. I've no patience for this kind of market... at least from a bearish perspective. Despite the strong bounce, the smaller 5/15min cycles are now clearly over-stretched.. and should see renewed weakness into the close. 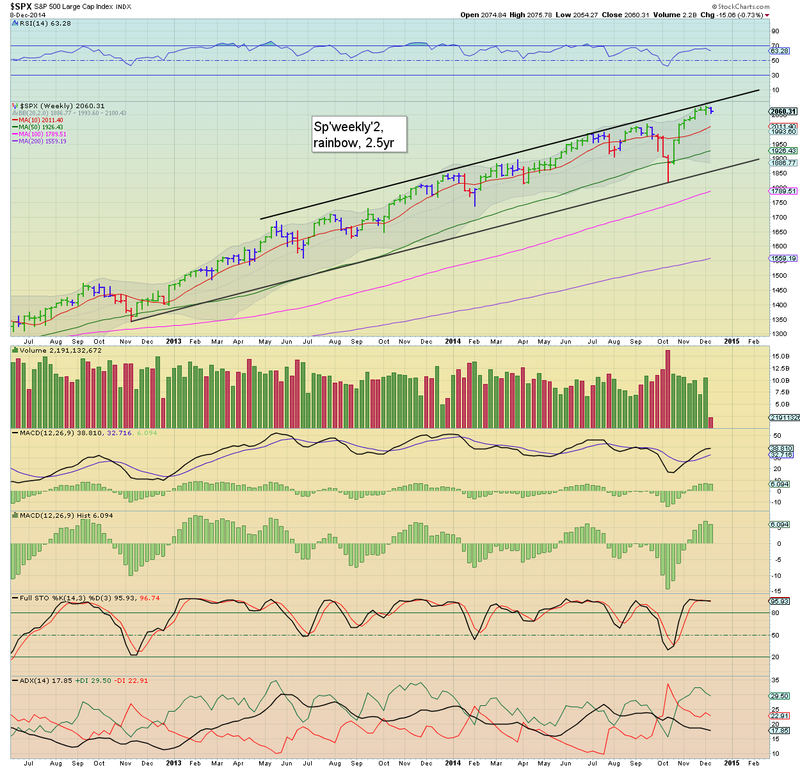 Next target remains 2020/15.... with a slightly bigger target of 2000 by next weeks FOMC. 2.18pm.. Approaching typical turn time of 2.30pm.... just need a break <2050.. and the door is wide open to renewed weakness... all the way into the close. Notable gains.. oil/gas drillers.. RIG/SDRL, both higher by around 4%... but price action remains VERY unstable. They were +4% in the morning.. only to lose almost all the gains... and having now reclaimed them again. Crazy action! US equities remain weak, but not surprisingly... above the early morning low of sp'2034 (with VIX 16.67). 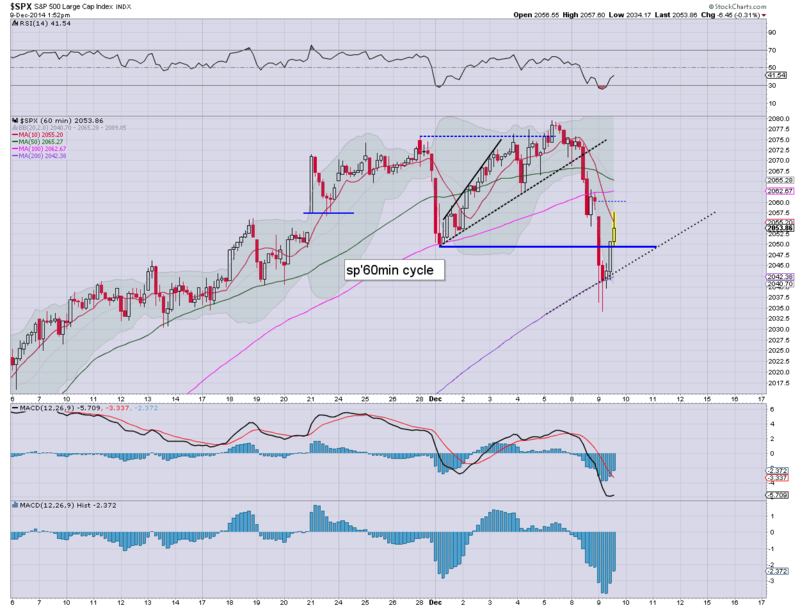 Regardless of today's close, there looks to be general downside into next weeks FOMC. The only issue is whether market gets stuck around 2020/00...or 2000/1980. Without getting lost in the minor noise - not least the current late morning bounce, a retrace is clearly underway, of the wave from 1820 to 2079. A brief hit of the giant 2000 threshold would seem pretty natural... by next Tue/Wed. Precious metals are holding the gains, which is really helping the miners, GDX +5.5%, but still stuck around old busted support of $20. US equities remain very weak, with significant declines across all indexes. VIX is holding sig' gains, +12% in the upper 15s. Metals are higher, Gold +$24, helped by a weak USD, -0.7%. Oil is very choppy, back to gains of around 1.0%. 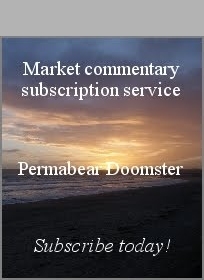 Suffice to say... with some decent downside... its a far more interesting market! US equities open sharply lower, with all indexes lower by a clear -1%. VIX has naturally jumped, into the 16s... with next key resistance of 17/18. Metals are catching a fear bid, with Gold +$19. Oil has swiftly lost early gains of 1.0%... already turning a touch red. 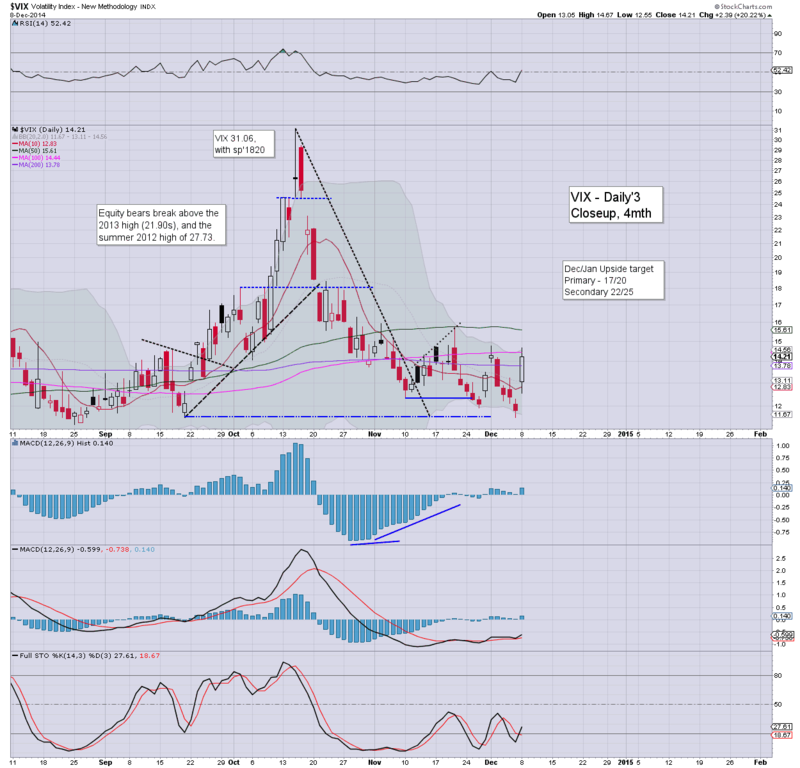 *the opening black-fail VIX candle - seen better on the hourly chart, I am somewhat dismissive of. An equity retrace is clearly underway, and regardless of any intraday bounces... VIX 17/18s look a given. Two down days in a row.... about bloody time! 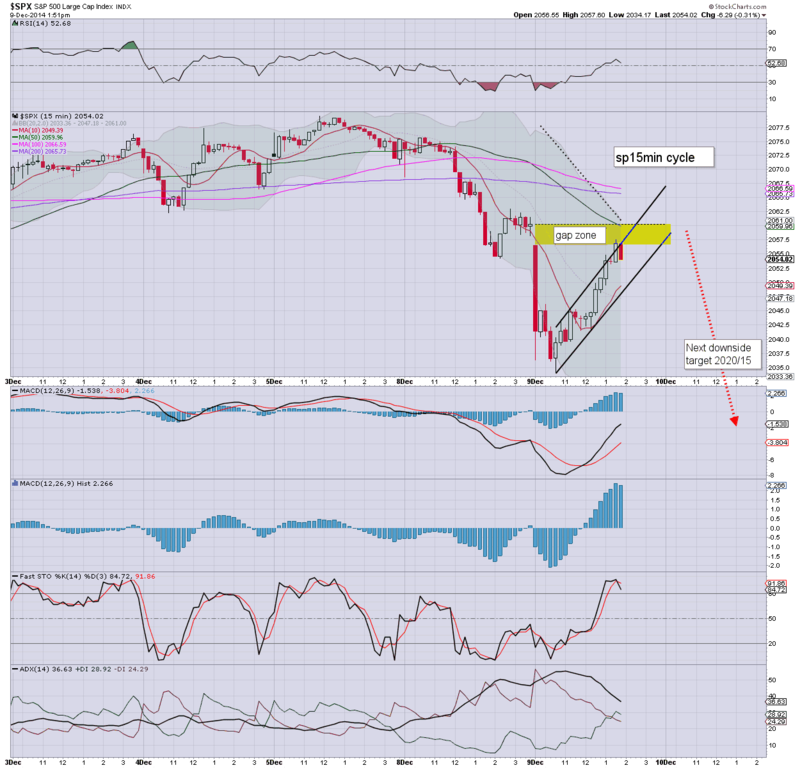 On any basis though... the clock is ticking.. equity bears have until next weeks FOMC. 10.38am.. sp'2034.. just another 5pts to go... for today... VIX 17s.. look due. 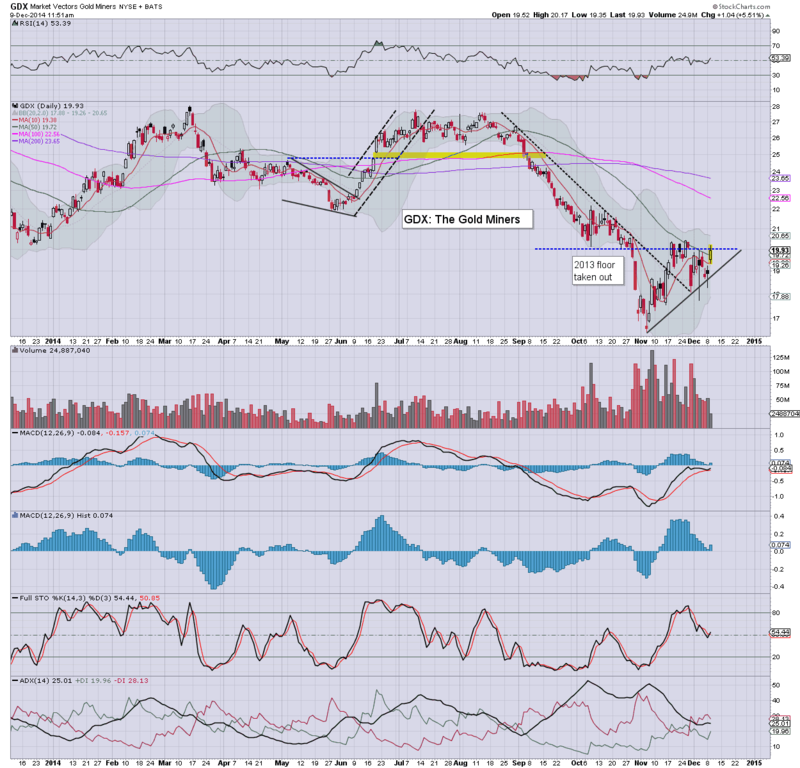 Notable gains in the metals, Gold +$27..the old 'fear bid' issue. Good morning. Futures are borderline significantly lower, sp -16pts, we're set to open at 2044, breaking the recent low of 2049. A retrace finally appears to be underway. Metals are rising, Gold +$12. Oil is bouncing, +1.0%. With follow through from yesterday - we have the first notable 2 days of decline since mid October, a retrace is very likely now underway. The issue of course... how low? 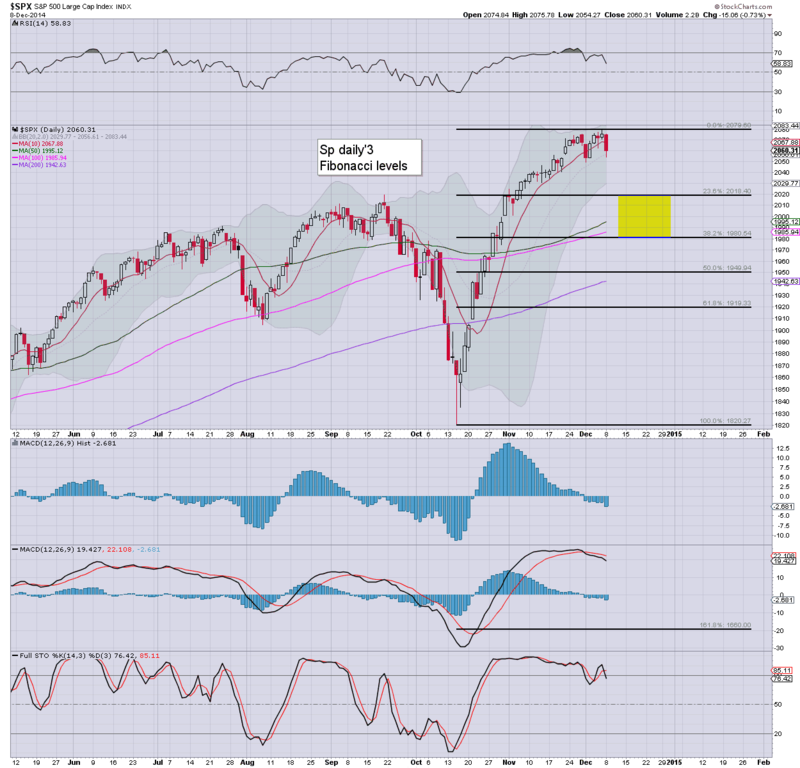 Primary fib retrace zone is sp'2020/1980. Certainly, the latter would be something interesting for the day-traders out there, but in the grand scheme of things, it is very little for most. There is a price gap around sp'2015, and the giant 2000 threshold will be damn hard to break... even briefly. Best guess... market floors around 2000 in first half of next week, and then strongly higher into year end. 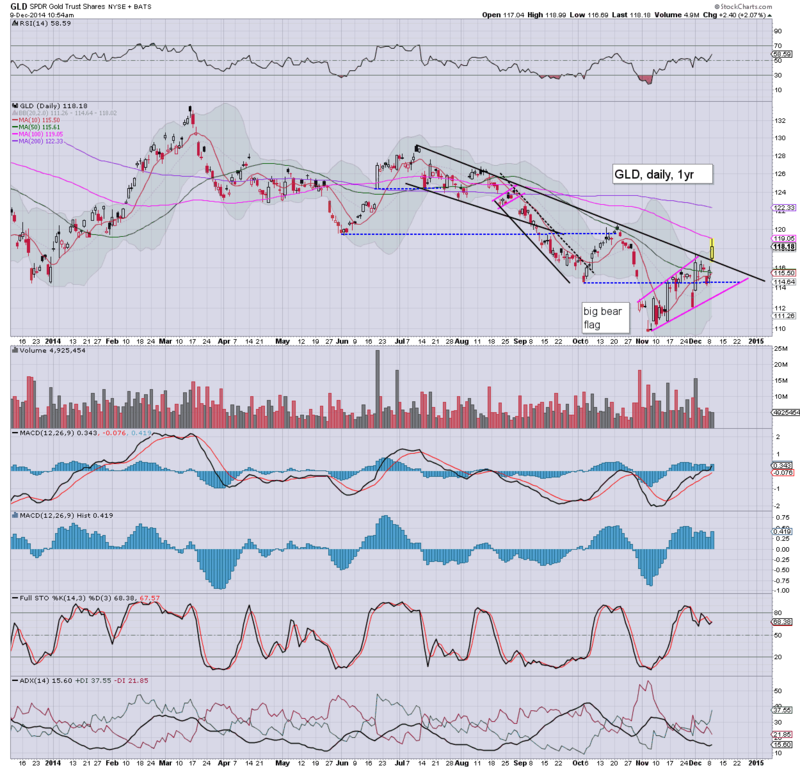 SDRL +2.9%... a bounce, within a very broad down trend. Secondary target $10/7. 8.40am.. sp -20pts... 2040... VIX will be in the mid/upper 15s. 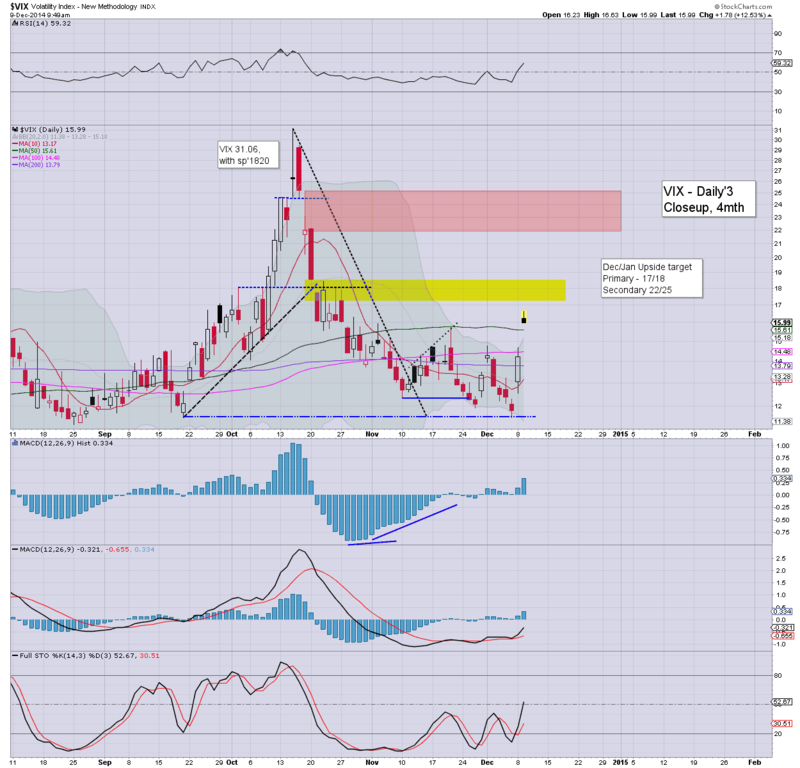 VIX target zone is 17/20. Sustained action >20 looks very unlikely. China market fell -5.4% overnight.. but still.. it has made huge gains since the summer. Still set for 3500 in early 2015. Regardless, today will be interesting... finally a retrace! 9.12am, momo stocks having trouble.. TWTR -3.1%... $35s.. next support around $30. Keep in mind, the FOMC is next week, and if we fall into it... then we'll be rallying after it.. yes? 9.24am.. lower bollinger on the daily cycle... 2030/29... so.. we should be -30pts at some point today... biggest fall since mid October. Might equate to VIX 17s...first resistance. 9.32am.. VIX opens +14% in the 16s.... so.. sp'2030 would be VIX 17s...later today. 9.49am... black-fail candle on the VIX.. although higher levels still seem due... across next few days. US equity indexes started the week on a negative note, sp -15pts @ 2060. There was particular weakness in the energy sector, pressured by another very severe fall in energy prices, Nat' gas -4.5%, and Oil -4.2%. 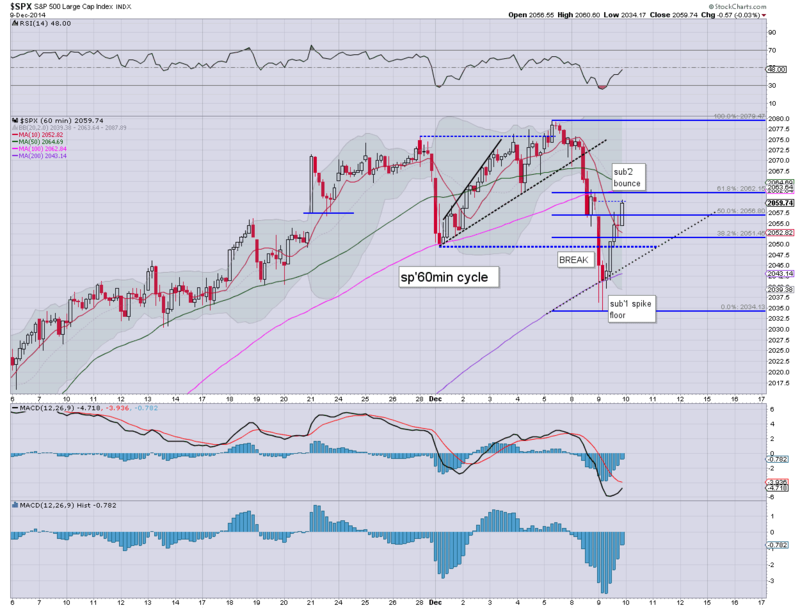 Outlook offers a minor equity retrace... flooring somewhere in the sp'2020/1980 zone. A marginally interesting start to the week, but still... we remain very close to recent historic highs. The continued weakness in energy prices are bullish for almost every sector of the economy... the exception being energy! Today we broke a new multi-year low in the $62s. A bounce.. somewhere from the 60/55 zone looks a given... probably on the order of $10/15.. back to 70/75.. and then another wave lower to 50/35 zone... in latter part of 2015. 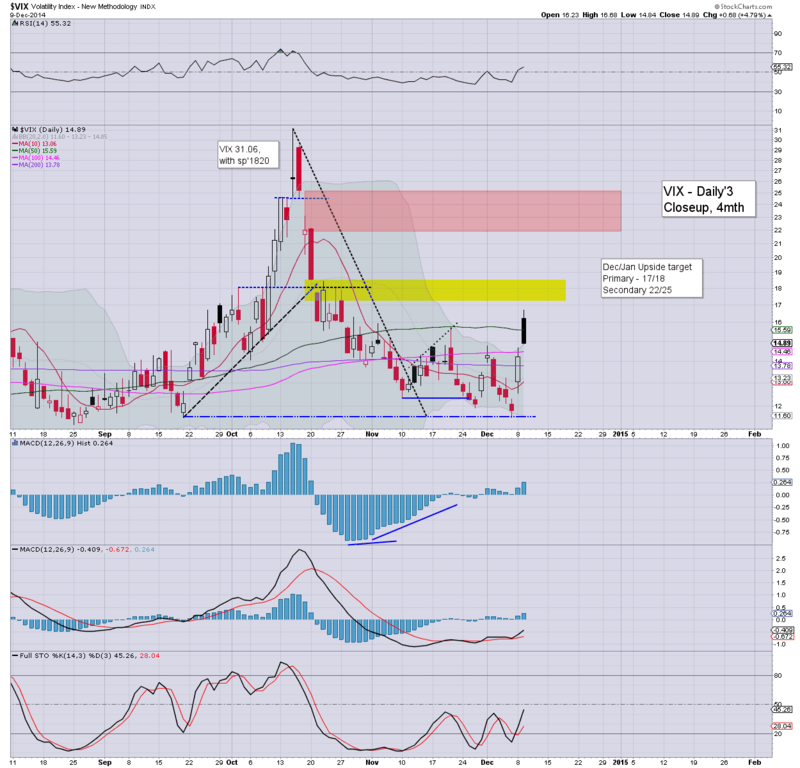 The VIX settled higher by a very significant 22.2% @ 14.21 (intra high 14.67). Not much due tomorrow.. just wholesale trade data. The only thing of note this week are retail sales.. due on Thursday.